It was as if a million voices cried out. Finally! Star Wars: The Force Awakens has finally premiered in theaters this past weekend. It was the last movie that I was looking forward to seeing this year. First, I need to be transparent. I was going into this movie with much trepidation. I went to the midnight showings of the Episodes 1 through 3 and was mightily disappointed in those movies. The hype behind this iteration of Star Wars has been building for a year. It was hard for me to be open minded when we were getting ready to see this movie in the theater. I and two of my best friends went to see it on a Saturday afternoon in a theater that had 21 and up seating which always makes movie-going a nice experience. When the final credits rolled off the screen, I had fallen in love with Star Wars again. the things that struck me at the end of the movie that I had missed in the prior movies was that this was Star Wars. It had the feelings backed in that I had experienced when watching Episode 4 through 6 when I was a much younger. 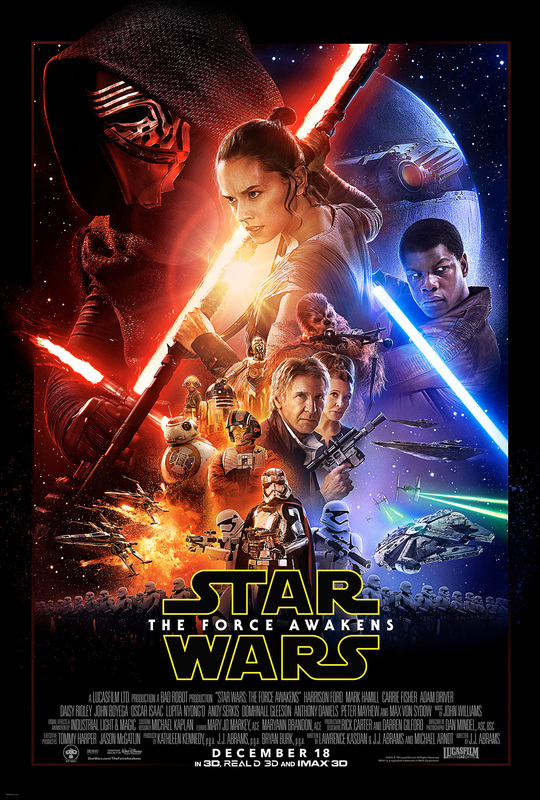 The Force Awakens captures this essence and blends in a more modern sensibility that feels natural and right. I love the two new heroes that are setting out to save the galaxy from the evil of The First Order. Finn, a storm trooper that has decided that he can no longer follow the orders of an organization that will slaughter innocents. Rey, A scavenger left behind on a desert world waiting for the return of family that she doesn’t clearly remember. Each of them is struggling to survive in place that seeks to subvert them. Finn flees the First Order that punishes any independent thought and Rey does what is right despite the thought she may miss the return of her missing family. I like that we get to watch as both Rey and Finn struggle with these two contradictory drives. Finn wants to be his own person but that has the cost of being subject to the whims of the First Order. He flees them knowing that what they are doing is wrong and his means of escape is to do something right. Finn still has to understand that to do what’s right means standing your ground sometimes. the audience gets to see as he has to work through this as he and Rey struggle to get BB-8 back to the Resistance. Rey struggles with the idea that she can not leave the desert planet for fear of losing a family that might return. Rey still does the right thing despite the fear that she is going to miss them while she is gone. She has to come to terms that this idea that she has been nurturing is nothing but a fantasy. Rey has to step out of this illusion and become something other than a scavenger waiting for something that will never come. On top of all this, Star Wars is still a space opera. It has thrilling chases, exciting space battles, and beautiful explosions. The movie is a visual delight that mixes practical effects, matte painted backgrounds, and CGI in a fashion that allows these movies to capture the feel of the first Star Wars and still look gorgeous. If I had to quibble, I missed seeing more of the original cast in this movie. I had the feeling going in that this would be more of a torch passing movie that what it really is. We get to meet the villains and the new heroes and see what they both are made of in The Force Awakens. I love all the new characters but I expected more of the old. Despite this minor quibble, I loved Star Wars: The Force Awakens. I plan on seeing it at least one more time in the theater. I give it four bear paws out of four. A definite must see for any geek out there. I love a good caper. I want to watch as a character works to create a plan to overcome some crazy obstacle despite ever growing odds. The thing that makes a caper even more entertaining is when it involves a team. The interplay between characters as the stress builds is riveting. The team creates a way to compartmentalize the plan that is more readily accessible. Scott Lynch’s The Lies of Locke Lamora uses the team structure to create a caper which is both fun to watch unfold as well as highly engrossing to learn how the players came to play their parts. Locke Lamora is the garrista, leader, of the Gentleman Bastards. They are a group of thieves in city of Camorr. Locke is the Mastermind of the gang. Jean Tanin is the groups bruiser and the most well educated. The twins Carlo and Galdo Sanza are jack-of-all trades capable of fulfilling many roles. The gang is rounded out by the apprentice, Bug. The shadow that hangs over the group and brought them together was Father Chains whom was a priest of the Crooked Warden, god of thieves. 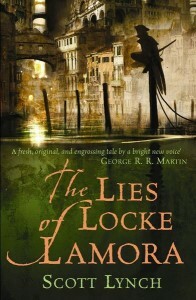 The lies of Locke Lamora is much like a magician performing a trick. The Gentleman Bastards are working a game on a Don. The reader gets to watch as the shells begin their dance on the board. Lynch shows the tricks as it place as well as taking the reader behind the curtain to see the secret. Lynch does this through steps into the past. Lynch’s jaunt’s into the past provide a spotlight on a particular piece of the world that the Gentleman Bastards reside in or illustrate the history one or two of the member’s of the gang. These vignettes provide both interesting history of the world or characters as well as pieces to the puzzle that is unfolding in the present timeline of the story. These drops into the past are much the same as a magician’s patter. They are designed to misdirect you attention as the layers build up on the progressing story. That aside about wraith stone was an interesting bit of world building but has little bearing on the greater story, or does it? Each step back is both a distraction to keep reader entertained while providing another piece of the puzzle that will end with a spectacular Finale. By far my favorite character is Father Chains. He is a Fagin that is actually concerned with the well being of his charges. He not only teaches them skills of thievery but those of numbers, letters, and history. his lessons can be harsh but never without a purpose. Each visit to his school room shows how his lessons have influenced the game that Locke and his men now play. I give this book four bear paws out of four. Scott Lynch creates a world and characters that are both rich and captivating. It mixes that levity of Leverage with the grittiness of The Wire without ever letting that darkness overwhelm story. There are turns in the story that I had to stop because I was so angry at what happened but I picked it back up again because I had to know how it ended which is the hallmark of a great caper in my own estimation. If you haven’t read The Lies of Locke Lamorra, I highly recommend picking it up. I am looking forward to finishing the next book in the series soon!